Wanted to use this with my hardware ms-20 but no midi support out. Waste of money. Doesn't seem like Korg will add it. The arp and sequencer are very cool what a shame. Korg seems to have abandoned this app. No integration into Gadget or Audiounit compatibility. I have a lot of synth apps, and even have Korg Gadget. This ranks low on my list of ease of use/usability. It’s obvious many people really like it. It’s just not of much use to me. Disappointed...and Korg is one my all time favorite synths, so surprised that I don’t like the iMS-20. App does not work right when using Inter App Audio, as the tempo goes haywire. Korg's notoriously poor customer service does not bode well for a fix. What a shame. Two weeks and counting...deleting this once fun and great sounding synth that has now become an expensive waste of space. This lack of consumer support has kicked Korg off my hardware wish list as well. Lots of better tools out there anyway. So long, Korg! Okay, soooo glad this is back up and running, but still have hard feelings. I had to really scramble to program other apps to replace this while it was down, so only giving 3 stars for this fantastic sounding synth and musical tool; maybe time will help me forget being jilted for so long. Death of tone and harmonics that this can create is incredible. The only thing I wish it had was the capability of using Tabletop. One of my top apps. Having spent many hours with its analog counterpart, I find myself increasingly impressed by how well this manages to emulate the MS-20 hardware. They sound and behave in very similar ways, I've no hesitation in declaring this app to be a fine substitution the hardware in almost any context. There are differences, to be sure... Both hardware/software have their benefits and detriments... But the fact remains - this is a truly impressive emulation, an incredibly powerful modular synthesizer, available on a touchscreen device. This future I like very much. Great application, very robust and versatile. Connected to a USB to Lightening adapter for USB audio out and you have the equivalent of the real IMS-20! With that said I was very disappointed today to connect my hardware and discover that the application will start but then close with the new iOS update. I plan to give this app 5 stars after the fix has been made. 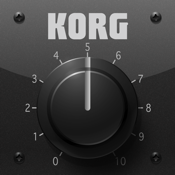 Seems Korg has abandoned this nice app. There used to be awesome templates and shared sessions to collaborate on, but they've disabled or broken that crucial feature. You have to manually re-enter patches, patterns, songs, etc by hand. Just like the 70s! Ugh. I use the iMS-20 on my iPad 2. I have several other synth apps, but none I have found offer such a vast combination of sound generation possibilities. This app does it all, if you take the time to learn about this program. The info in the manual is great for beginners, too. With enough knowledge, one can emulate virtually any musical instrument and produce an entire composition from rhythm to lead. This app offers so much for so little, compared to prices of physical synth machines. You can even utilize dual kaossilator pads or a virtual keyboard for live performing or recording. If you make music or are interested in learning how to create electronic beats, this app is a must have. As a newcomer to synthesis, the challenge of understanding, alone, is enough to occupy my focus for hours. My favorite aspect to using this app, are the results I see while merely using the app. Becoming familiar with the array of variations and manipulations available will perhaps keep me entertained and learning for years to come! More support for the taktile would be great! I bought both of these for each other . Booting in low power mode is a pain, And half the controller does nothing. seems that korg would want people to use there products together, not so much. I love this synth. I would love to see iMS-20 and the 80's Classic iPolysix integrated with Gadget. I've loved my kong legacy collection, so naturally I got this, it's a close recreation of the sound. It's a great mono synth but I have to admit I grew used to using it as a poly synth with the software. I'd love that to be an option here! Court is obviously the world leader and synth. The app is brilliantly designed and works seamlessly with the MS 20 controller that came out in the early 2000's. I love the sound, the patchbay, the drums, the sequencer triggering. It is absolutely brilliant. Great app, fun, easy to use but also in-depth enough to make something great. The only area for improvement is in the exporting capabilities. I'd really like Dropbox capabilities or a way to export .WAV patterns to iCloud. AudioCopy doesn't work and their product isn't really that great after all. So close...yet not quite there. Why can't you change the pitch of a sequence using the keyboard? Should be a basic feature but still missing. Midi connectivity, link, AB3, still behind the times. This is a great synth and potentially one of the best iOS music apps but you seem to have forgotten about it. It sounds great, and you can have a blast messing around. I do wish it could be used as a plug in. They should also find a way to incorporate it into Korg Gadget. It does not seem to work well with inter-app audio. glitches, saturates and sometimes downright goes into a bizarre continuous sound loop. Please fix. Awesome sound, one of the 1st apps for my iPad Air 1. Awesome sequencer, Drums would be IDEAL if they could be tweaked LIVE.... However this app would rule if it had Midi I/O. How hard can it be to add this feature? Every other iSynth has it... I have had iMS20 for over a year, still use it, glad to see it was recently updated for bug fixes etc, ya forgot one feature ....THE Midi!!! Sorry, WIST doesn't cut it... It's toy technology. If I could Sync this w/ Hardware I would add it to the table and not just record 4 bar loops for other apps/gear to play with. I ain't buying the hardware, the beauty of this is the state saving. I run the out into an analog filter. Anyway, big fan never the less. Korg rules - SD4000 delay, Toneworks, Microkorg, (2) ElectribeR, EMX, monotron Delay... All that. Sup' son? This is a great app however, after ios 8 was installed, it will start the app just fails to load and goes right back to the desktop. I play in a funk duo band called urbanfunkmachine, nothing but this app and a live drummer. Korg, You Guys Rock!!!!!! KORG ims-20 Still #1 app. Okay, the MS-20 is my favorite monosynth; I have yet to come across the sound potential of one that is more pleasing to me. That said, I have yet to own the hardware due to two reasons: First is space... I simply don't have room for a mini yet. Second, I think the patch panel is difficult to understand. That's where this app comes in. I bought it to learn the structure of the MS-20 before buying the real thing. Unfortunately, the manual in the app doesn't offer a lot of information regarding the patch panel, but there are videos from Automatic Gainsay on Youtube where he thoroughly explains not only the panel, but the entire synth. Those videos invaluable when learning how to use the MS-20. This app has tons of features that make it well worth the money... a full fledged sequencer, effects, etc. But my favorites are the greying out of ins/outs on the patch panel (so you know where you can and can't patch), and the zoom ms-20, which allows you to zoom in on the control panel and patch bay; extremely useful when hooked up to a midi keyboard, so all you have is the controls without the keyboard on the screen. In short, this app is a fantastic alternative to the hardware and a great educational tool. I've had iMS 20 for years, and I still think it's one of the best. I'm not going to repeat all the rave reviews. Read them—it's all true. One downside: For those new to synths, iMS 20 will most likely be a challenge. I trigger the iMS-20 from an M-Audio Oxygen 8 v2 via the Camera Connection Kit, through a powered USB hub. This app is also behaving fairly well with AUM. I have sweet spot for all things MS-20 since I grew up with one. Since the original MS20 (or the mini) isn't really something you carry around and start playing at, say: the airport, or in a car, this app gives you a really close emulation of the synth and a sequencer to experiment with and get astoundingly life-like results. Really impressive app. Great reproduction of panel, sonics, character, and functions/features. When you aren't with your synths, this app furnishes you with limitless and useable synthesis power. I even tried some tricky patches from using the hardware version (namely: the paraphony via sample and hold trick), and it does just what it should. If you're a synthesis dork like me, you'll likely love it. Five star app. I have a 3-4 year old iPad. Please fix this bug. Update: Thanks for making it HAPPEN! None of my Korg synths are working since the iOS 8 update...Moog,Cubase & others have updated...Korg, make it happen! This a good synth but I was disappointed that I could not link DS-10 & DS-10+ via Bluetooth. They should do something about this. It would great to be able to link my Nintendo DSs to my iPad via Bluetooth. Gotta love a 30 dollar app that doesn't work with the new update. Get on this korg. Crashes within a second or two on iOS 8. Please, Korg, you can't charge for this app and not keep up with development, otherwise it's not even a toy, let alone any professional use. Love this app. El sonido es muy similar a el sintetizador que emula. Se las recomiendo 100%. It has a "rate me" nag screen that may pop up while you're playing (like it did for me). I love this synth. I was considering getting the hardware version but thought I'd try this before shelling out the money. The presets are great but the real fun comes with making your own and experimenting. There is definitely a learning curve and it certainly helps to know what the knobs and patches are for but, you'll figure it out just tweeting around. People have things to say about Korgs pricing and whatnot but the fact of the matter is its worth every penny. Amazing sound and endless modulation are what this app is all about. Pluses: • Beautiful GUI. This iOS version has a much better GUI compared to the desktop AU/VST version. Nice icon too :-) • Compatible with the mini MS-20i USB controller keyboard (yes, you can do patching in this synth via the hardware controller). • Great/classic sound ability, x2 synths, and drum sounds. Minuses: • No Korg Gadget integration. • No IAA transport controls. This is a problem with ALL of Korg's apps. • Poor MIDI support, making this more of a standalone audio source, rather than an interactive performance synth. • Lousy sequencer for modern devices. It's fine to mimic old analog sequencers in software, for fun and certain sequencing styles, but not when that's the ONLY option on offer. iDS-10 makes iMS-20's sequencing look like childish, primitive, unusable garbage. iDS-10 and iMS-20 share so much in common that it might have been better for Korg to release an iDS-20 (merging the best of both worlds). • No polyphonic mode. The desktop MS-20 plugin supports polyphony, so there's no reason not to have it here as an option. • Fiddly controls. This is a problem with ALL of Korg's apps, especially Gadget. • No data exchange via email. • No data exchange at all (the Soundcloud integration is absolutely NOT acceptable for patch exchange). Now Working On iOS 8 !!! Sitting in my personal studio, surrounded by analog and digital hardware yet, I'm reaching for the iMS20 at every turn. This synth has a character of its own that makes it a fundamental tool for someone like me who needs something new and exciting when sculpting sounds. Will not disappoint. THIS!!! This app was my reason back in the day for buying n iPad *1*. This ran (runs!) great on an iPad 1 just as it does on today's latest models. Would love to see Korg add MIDI channel select, but apart from that, from the delicious skeuomorphic (realistic) look and feel to the sound - as demonstrated on youtube - being comparable to a real MS-20, make this app one of the best. You have to understand how to program a synth patch to use it effectively, (plenty of tutorials on YT), or, use it as a means of learning that :-) Fantastic. *Highly* recommended! Got it after the iOS 8 update, so fortunately I didn't have to go through the pain others did. Very happy with the app, slightly different than the real thing in terms exact settings but very close. Love having the sequencer.